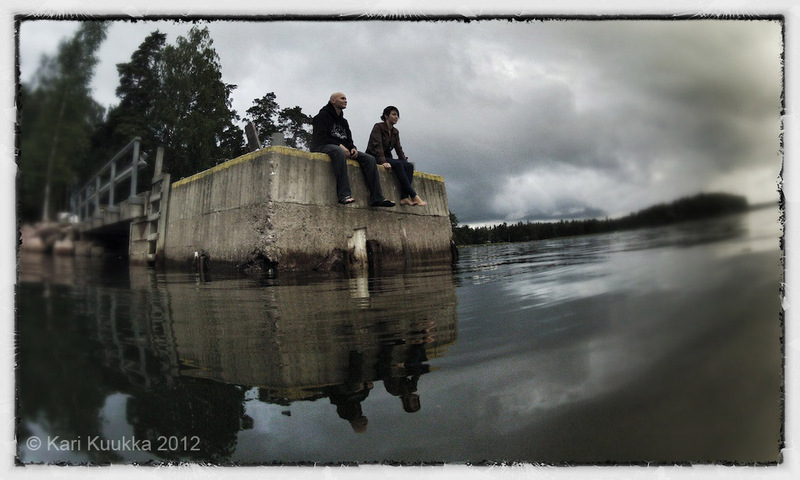 So what does a photo­grapher do when he is on vacation? Naturally: plays with cameras, what did you think? 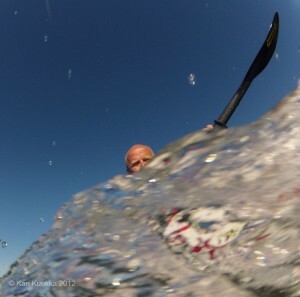 But: been working with this one project (a demo for a client, so cannot really tell too much about it yet)…and this has led me to experiment a bit with shooting from a kayak — and more speci­fically: shooting with GoPros as remotes. 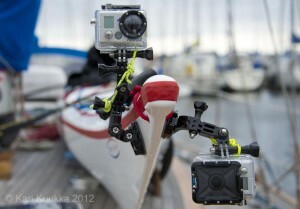 I’ve been playing with different set-ups, with different boats, but most often I’ve typically used two GoPros with WiFi-packs simul­ta­neously, mounted either with a suction-cup attachment or permanent (i.e. glued/laminated) attach­ments on a fiberglass boats. i have attached them at the bow, at the aft, side, deck, paddle.…. 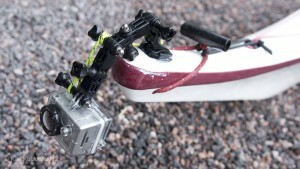 The boats I have used are Reval Mini (of Tahe Marine) which is 481/51cm with retrac­table skeg and SmartTrack rudder (adjus­table from the cockpit, which is real nice feature) and the legendary Nordkapp 548/52cm (of Valley) with retrac­table skeg only. 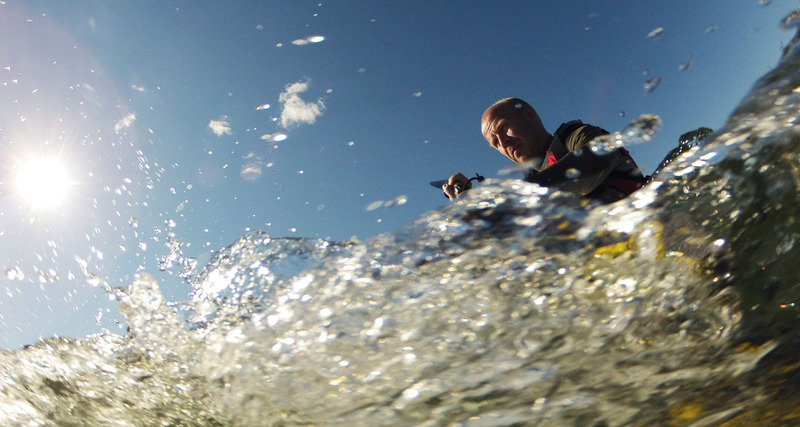 The Reval Mini is really agile (it has serious rocker so you can maneuver it real easily in the waves) and meant for a lightweight paddler — which means that my 73kg is on the upper limit of that boat. It dives into the waves easily (i.e. nice, dramatic images), but I don’t feel comfor­table at all with it when the wind picks up . Too low primary stability to my taste (and weight ) in strong swell and wind. 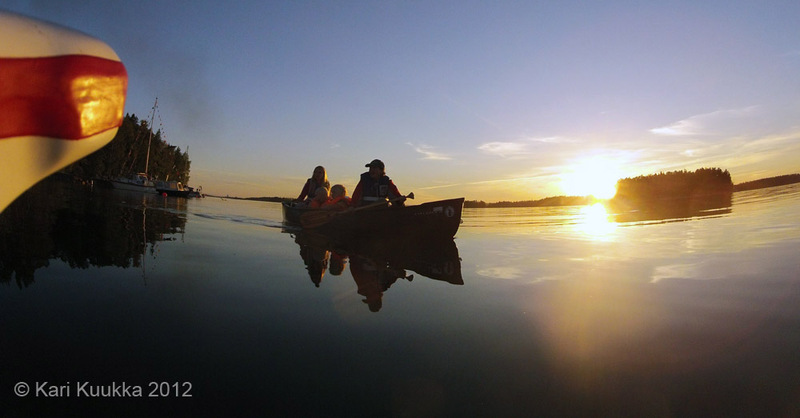 But: the rudder makes a world of diffe­rence in calm water when you want to point the camera(s) accurately — or if you want nice steady sweep of video footage. 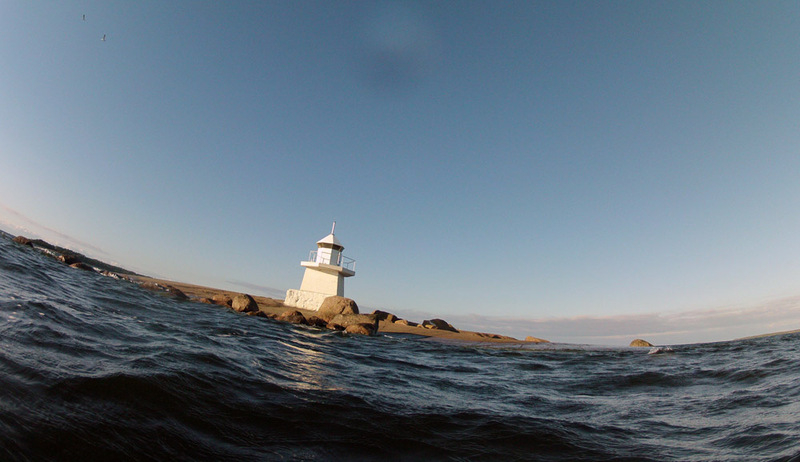 The Nordkapp… well, if you know anything about kayaks, I really do not have to say more. 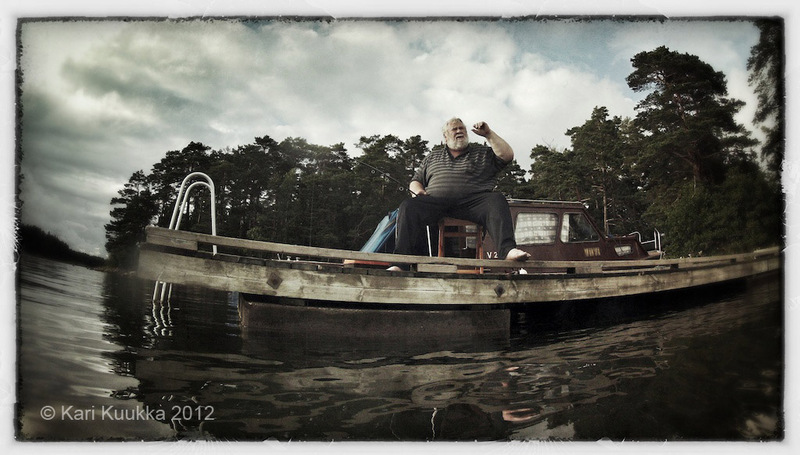 If you feel the weather is too much for you… well, it is you, not the boat which is to blame. Funny detail: I’ve been practicing rolling with both of them (with cams attached), and for some weird reason I find the NordKapp much easier to bring back up. Don’t really know why (maybe the rudder which I usually do not use as default — i.e. which is then down when your head is down) or the form of the deck — or the fact that the primary stability of the NordKapp is much noticeable so you don’t feel you go over to the other side when you roll. But it’s real strange — you would somehow expect the opposite. Anyway: couple of images of the set-up. 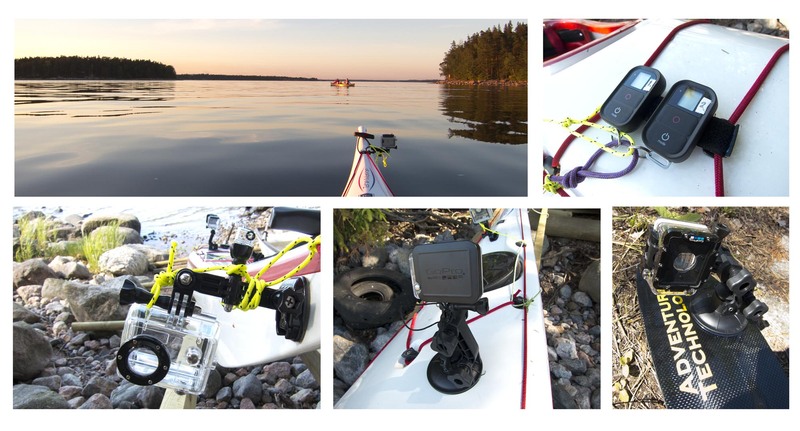 With the Reval I have three glued positions for the cams and because of the form of the bow they come a bit lower to the water as compared to my NordKapp. The NordKapp I modified: flattened the topside of the bow and laminated an attachment point. I really like the fact that I can point the cam straight forward, adjust the height and the angle/tilt without worrying if the tip of the bow will be visible. I have used the LCD-screen attachment to position the cameras, but it is very easy to make mistakes in that. I do have one housing which is flat port i.e. suitable for underwater images as well — but maybe the biggest asset is the fact that this housing comes with protective cup to safeguard the front of the cam while setting the boat in water etc. — which the standard housing does not have and this freaks me out a bit. It is so easy to scratch the front of the lens — and this FOV/wideangle/DOF the tiniest scratch will be visible. I have set the remotes separately to two cams — although, if I understand correctly, one remote can control up to 50 cams. I origi­nally used them on the deck, then attached to my floating device, but now I have pretty much settled having them attached to my paddle. They are easily operated with your thumb and your hand does not have to leave the grip. I have rolled with a paddle having them attached and there has been no inter­ruption in the network and everything have been operating real smoothly. The remotes come with these “keyring attach­ments” which are real nice for securing them onto the paddle with a small leash — that in addition to the velcro strap used for mounting them. Basically the remote gives you all the controls you do have with the camera as such: change of modes, intervals, formats, etc. If you program the camera to capture upside down, also your display in the remote is upside down. It has a small red light which confirms that the camera is working correctly. Very sweet indeed. Also, GoPro is promising that in the nearby future you can control the cams — and even stream live feed — with an iPhone/iPad. 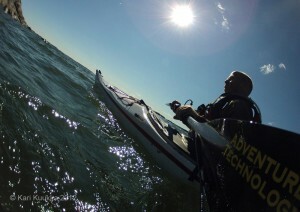 Holds lots of promise.… but I really do not see myself taking an iPad into the cockpit of a kayak. There are always issues. Power failure — or more like the lack of power when you need it most — is the most notable one. With this set-up (2 cams, WiFi-packs, remotes) you have six different thing which have to be charged. All USB… so be prepared to have powered hubs with you to keep you going. Or as in my case (living on a sailboat), make sure you have enough 12V/USB chargers. The best method I have found in terms of being economic with the juice is to keep the WiFi-Pack on, but to keep the cams and the remotes off until using them. Another issue is conden­sation inside the housing, which typically forms onto the center of the lens. I gotta work on that, come up with a solution before the water gets cold again. GoPro sells a pack of silica-gel sachets which fit inside the housing but the price was pretty stiff if I remember correctly (for something like that). Again: the lens with such DOF/FOV shows even the slightest conden­sation as very disturbing. What I mean by this: what does this give you extra what a “decent/real” camera does not give you — i.e. where would you like to use something like this? 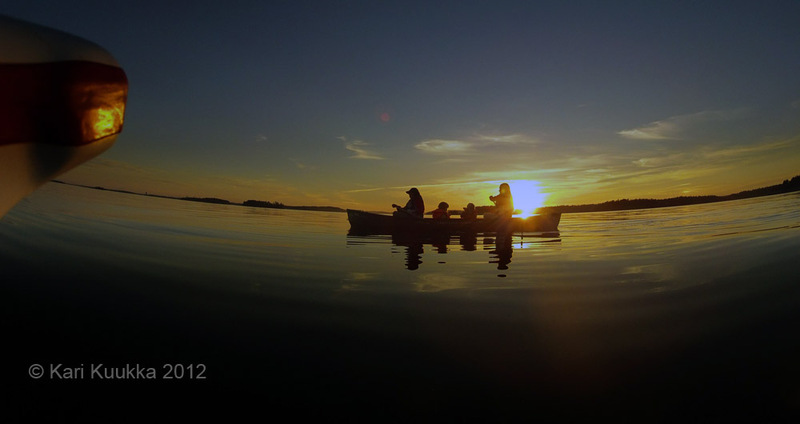 Well, the most obvious is the I-love-me images… of yourself or the person you are assigned to shoot as kayaking. 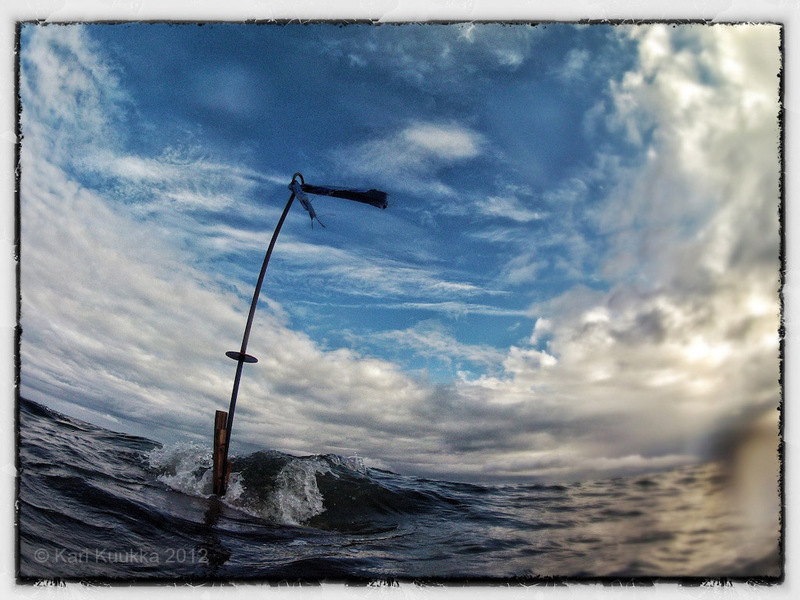 What I like most though is the possi­bility of extreme wide-angles very near the surface, touching the water sometimes.… you just cannot do that with a point and shoot — and no way you would dig out EOS1X or D4 with a fish-eye in a kayak… or 5D/D800 for that matter. At least I would not try to do that. But: here are couple of examples — straight forward photo­graphy — I have left the bow into some images on purpose to give some perspective. I have also gotten into a habit of checking the images with an iPad (real handy in a sailboat — using a laptop is just so much bulkier and also requires more juice from the batteries)… and the other day I started to play around with the Snapseed app. No, I am not going crazy about cheap effects/p­seudo-hdr/ins­tagram kinda stuff — content is the king, as Jeff Jarvis said — but I sort of like the feel in these last three which I shot just the other night right outside Emäsalo. 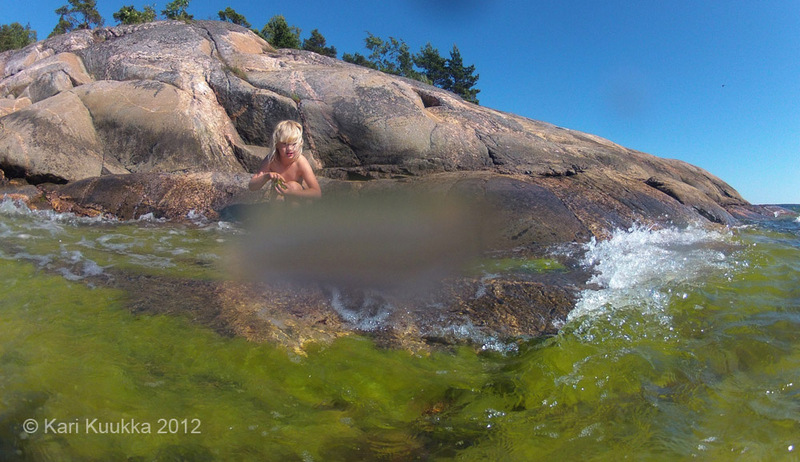 I mean, this is what summer in Finland really feels like, right? At least, this is how my world looks like. But: I guess I have to start getting out of this “vacation and fooling around” -mode: next stop is the London Olympics, starting next week. Those Go Pros are literally one and a half genera­tions away from being full blown mirror less cameras! And after using the tiny Olympus OM D for the past couple of months the Canon 5D mk lll let alone the X seem massive and have crappy merely optical viewfinders. Nikon and Canon know this and are very likely crapping their collective pants. nice to see you have found this blog. I would not go as far as ditching my 1X’s and 5D’s yet — well, not before the Olympics at least — but I am pretty impressed with what these little suckers can do. Lot’s of potential. I am dying to show the stuff I am doing right now, but as I said, it’s for a client and publication is as far as early 2014… Damn! I love the first image. I think it’s perfect in every aspect. I haven’t tried many of those small cameras yet, however, while I’m very tempted by the GoPros for behind the scenes kind of shooting, I can’t agree on the 1DX / 5D “bashing”. For me the 5D3 is an amazing piece of equipment and as someone who picks up his camera before anything else every morning, size and weight are no issue. My 5D3 is currently ungripped and more often than not I wish it was a little bigger, so that it would better fit my hands. My girlfriend on the other hand is asking for a smaller and especially lighter camera everyday. So smaller and lighter might be the way to go for some or even most people, but perso­nally I can’t agree on that. But for now thanks for sharing these photos with us, enjoy the Olympics and bring us more of those 1st images Kari! Do you leave a shadow when you are dead?